My trip continued from Zurich to Lucerne [Zurich Trip Here]! The two cities are an hour apart by train and a one-way fare is CHF25 (purchased on the day of travel). The first sightseeing that my friend and I did was to go out of the city (10 minutes by train) for a tour of the Aeschbach Chocolatier facilities. Return fare (priced as a day pass) is CHF15.20 (zones 10 and 28 access). Mount Pilatus in chocolate! We weren't able to visit the real Mount Pilatus since it was raining during our stay and there was limited options to ascend/descend the mountain in the winter. The exhibits are interactive and and there is plenty of tasting involved. There are windows overlooking the production facilities where the chocolate designs are hand painted and hand wrapped. My friend and I spent little over an hour touring this chocolate world and it was very enjoyable. The admission is CHF15 (with CHF5 coupon valid in the shop or the cafe) and there is an English language option for some of the displays. Heading back to Lucerne! The chocolatier is only steps away from the train station Root D4. Paintings inside the Chapel Bridge. Unfortunately a fire in the 1990s destroyed many of the paintings. Switzerland is very expansive and Manora is a more affordable option for a meal. It is a self-service restaurant on the top floor of the Manor department store (a chain). A main and side cost under CHF13, which for Switzerland, is about the most affordable option if you plan to dine out. After lunch, my friend and I went for a walk along the old city walls. Circling back to the old town: the Mill Bridge and its small chapel with red exterior. This bridge also houses paintings overhead. We then moved on to visit the Rosengart Collection for its collection of 19th and 20th century art. Admission is CHF18 and there is no audio guide. There are handouts with descriptions of paintings available in English. After the art museum closed, we had a snack before heading to the Jesuitenkirche for a free organ concert. Last stop of the night is dinner at the Italian restaurant Rossini nearby. 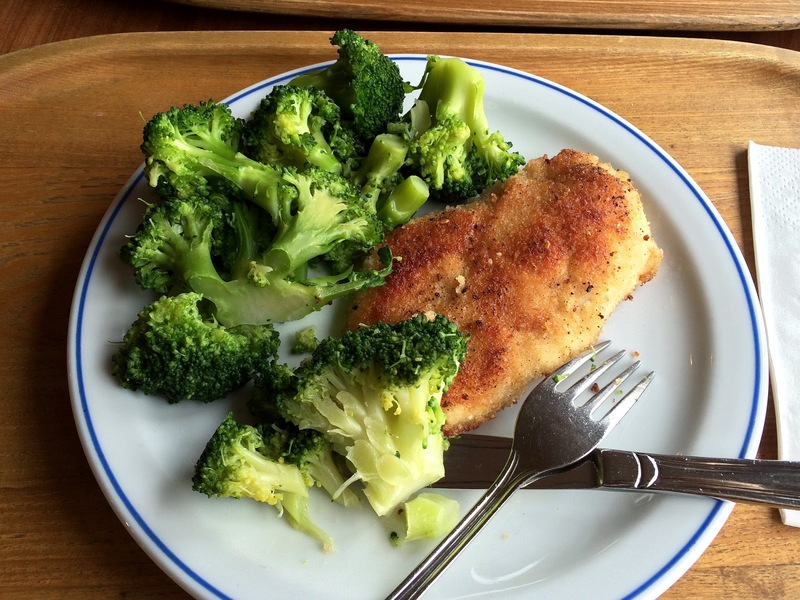 I didn't take a photo of the calzone that I ordered, so I will pop in a picture of my dinner from the previous night. 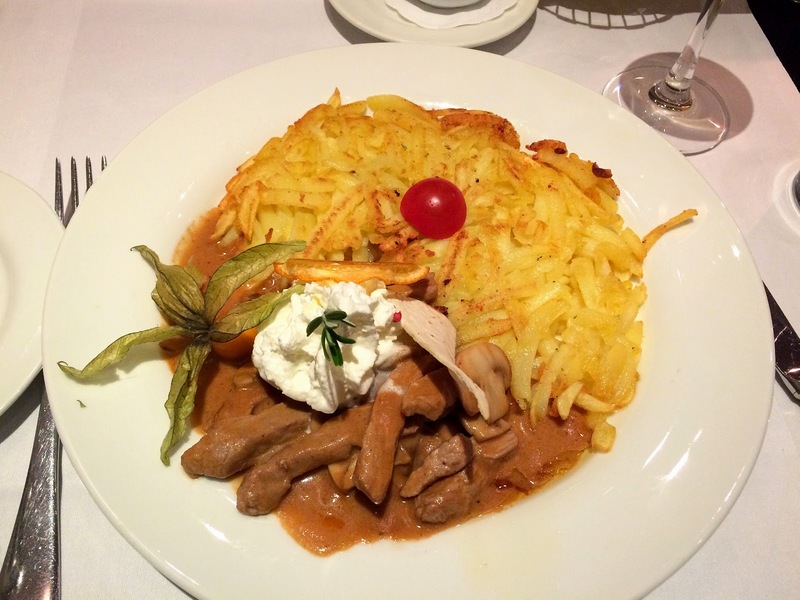 We dined at the Waldstaetterhof Hotel Restaurant and I had the classic Zurich style veal with hash browns. Day 2 started with another city tour! The regular price is CHF 18 and there is a CHF2 discount for overnight visitors staying at a Lucerne hotel. As my friend and I had already visited most the attractions the previous day, the tour was mostly for us to learn more about the context of each place that we visited. Here we are in front of the KKL Luzern culture and convention center with a view of Lake Lucerne. Inside the main train station, the decorations for the Lucerne Carnival are already up and floating! This is one of the many festivals that Lucerne hosts every year. I am ending this post with my chocolate purchases in Lucerne. I tried a sample of the Blood Orange CaramelPlättli in Max Chocolatier and I had to pick up some to bring back with me. These thin squares have a tiny layer of caramel that melts without sticking to my teeth. So so good! Although I wish I could have visited Mount Pilatus and the Richard Wagner Museum (closed until March), I am very fond of Lucerne. On to Bern!